Final week of Pre-Production !!! "Have you taken care of this?" "Is this the absolute and final, final revision we’re making?" "Have they signed the contract yet?" "Is there a runner free?" "We can fix it in post." "This needs to be picked up today!!" "I look like an Oompa Loompa!!??" Just a few of the things heard around the office this week as we finalised call sheets, ran through rehearsals, had costume fittings and makeup tests, realised we’d forgotten a few things and generally waited until the final hour to cast one of our key parts and a few of our supporting roles in the film. Action stations were brimming and everyone was running around like headless chooks though slightly calmer as we locked in logistical elements and added extra crew and basically got s**t done! Having moved from our tiny 10m2 office in St Kilda where we were overrun by props, costumes and people being so close to one another that we’re all a little more familiar than we probably should be with each other, to our amazing and spacious offices in Docklands where you have enough room to stretch out, sleep and drive your car right into the studio space, you can imagine, we are all just a little bit happier. Waiting for us in the kitchen, a wonderful welcome basket from Rosie and the team at Docklands. They have been amazing so far and we can not thank them enough for their tremendous support. After consuming the goodies rather quickly, we went about setting up our main production office, and without doubt, one of the star attractions of being at Docklands is having the wall space to set up what Daniela calls the “Massive thing on the wall” or what most folks in the industry know as the Production Schedule Board… lol we love Daniela!! It took 3 days to set it up just to have it pulled back down next week when we shoot some office scenes in this room but we don’t care as we’ll just put it straight back up again once we’ve finished filming. We love it and it helps tremendously in any production to have a visual reference of the schedule for all departments to see. With offices being taken up for Costume and Art Department, another room for rehearsals and a beautiful MU and Hair room, it suffices to say that everyone was feeling pretty comfortable in the spaces provided to us. I don’t think any of us are going to want to leave. One of the biggest challenges on this film is the fact that we are shooting it in Black and White - we ran camera tests in and out of the studio and at our Post Production House, Roar Digital, to ensure makeup and wardrobe would appear correctly on screen and this is by no means an easy task. Our MUA Mirjana and Costumes Dept, Sarah Jayne, worked very hard to get the required look and after several meetings and long discussions in regards to this matter, we have settled on the look and know that the end result will hopefully blow you away! The studio space is slowly being overtaken by the set as our building team made up of Liam, Jimmy and Carlos and led by Production Designer, Fiona, make up for lost time by having to work twice as hard to get the set construction finished so that the actual set building and dressing can commence. Keeping an eye on them to make sure they get it all done properly, on time and in budget is Liam’s trusty companion and our loving set dog, Tsu! Building enough flats to ensure we have what we need is one thing, but our set design is a complex one and our builders have come in at the last minute and are making miracles happen for us by handcrafting the vision our Director has for this film and we truly appreciate all their efforts. We’ve had a lot of the actors coming into the office this week so it’s a good thing we like them so damn much! Lucky for us they are some of the most professional and easy going people we’ve had the pleasure of working with…. so far lol They have spent some crazy, intense hours working closely with the Director every day this week and we can see the actors loving every minute of it and really sinking their teeth into the roles. We can’t wait to see them bring these characters to black and white life on film. All in all, a productive, hectic, crazy awesome week had by all and we finished it all up with one last production meeting and by hitting another milestone by reaching 3,333 likes on our Facebook page, which you should go like too if you haven’t already…. please. From all of us here at Choir Girl, thanks for coming along on this crazy ride, as of next week, we’re all going to be out on location, the blog might be a little late as it has been over these last couple of weeks as Daniela and I have work to do apparently but we’re looking forward to letting you know how the first week of shooting went! If “film is a battleground” then bring on the war I say and let’s make a movie!!! Props and Costume Choir Girl. This week has been pretty hectic (hence a slightly shorter blog today) and it has highlighted the importance of teamwork and assigning different jobs to different team members and working together towards the overall goal. While Ivan and Daniela were glued to their chairs in the office, filling in forms, filing permits with 3 different councils, speaking with accountants, lawyers, government officials and generally dotting the ‘i’s' and crossing the t’s, Lucinda was off in meetings over at our Post Production Facility, Roar Digital, talking with the Director, Script Supervisor, Photographer, Production Designer and Graphics Designer in order to ensure certain important elements needed for filming would be in place and locking in final changes to the script. 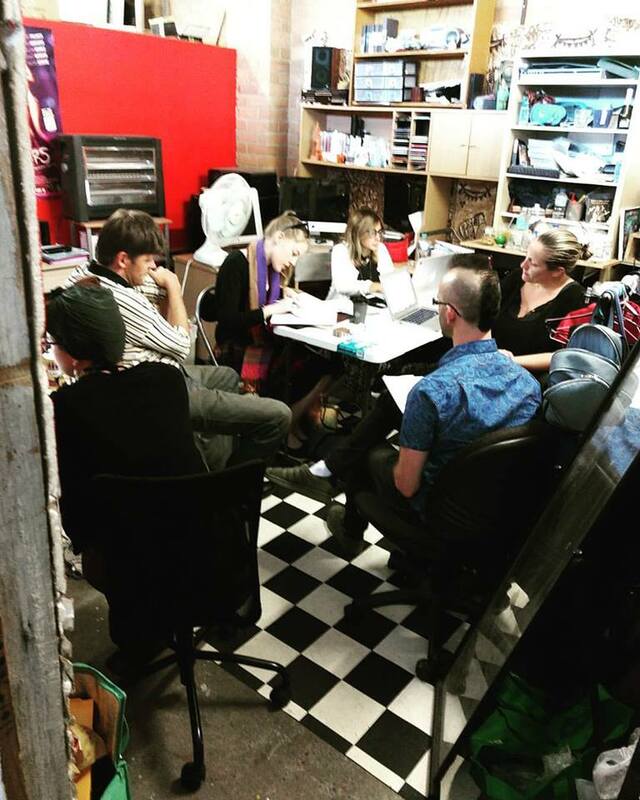 Outside of the office and meetings, our Production Designer, Fiona, and our Art Director, Sarah, have been scouring the props stores, tips, auctions, garages, clothing stores and antique stores of Melbourne, Geelong and even Ballarat to secure some of the props and costumes needed. The office is overflowing with people, costumes and props so needless to say, we can’t wait to get into Docklands Studios! The week has culminated in a great meeting with Film Victoria and though we still have so much work to do, we’re all getting pretty excited with how things are moving along and the progress we’re making in locking in locations, cast and crew and with just 3 weeks left of Pre-Production, we’re feeling pretty solid as a team. We would also like to take a moment to recognise that Wednesday 8th March was International Women’s Day, in recognition of this, we are very proud to be a film crew made up of an equal amount of men and women, especially on a film such as Choir Girl, which in itself and amongst other things, is an exploration of misogynism. As we head into our second week of Pre-Production, we've spent most of the week scouring the streets, alleyways, train stations and old hidden buildings of Melbourne to find the perfect locations for our film. With our key production team composing of our Director, DOP, Production Designer, 3 Producers and several cameras tagging along, our first stop was an old section of a hospital that forms part of the Royal Melbourne Hospital, it has been used for some notable Films and TV series such as Alien, Dr. Blake Mysteries and several more. The remnants of a bygone era remain throughout the hallways and rooms of this beautiful building and we're excited to be filming at this particular location. With the Director and DOP brimming with excitement from this first scout, we moved on through the traffic-jammed streets of Melbourne to the eclectic mixture of old vs new that makes up Kensington and Flemington. Checking out the commission flats that sit next to the heritage houses whose value sits in the millions, we were sure our lead Character, Eugene, would find his home here among the clash and ruin of poor vs rich. Where one street over means the difference between clean streets or syringes in the gutter. Reality slapped us in the face as we entered some of the areas where the poorest people live. Rubbish lined the streets, broken windows lined the buildings, cats howling for food and dirty piles of junk left for someone else to clean up. The location is perfect for what we need but it certainly brings the mood down a little so we headed off to our next location - Racecourse Train Station in Flemington, if ever there is a contrast of poor to rich, this is it. Flemington Racecourse is known around the world for hosting the Melbourne Cup, Australia's most famous horse race. The Train station itself is only open on race days which makes it an easy location for us to control during filming and sometimes this is what a location decision can come down to. As we heard the rumbling of trains, we realised it was actually the rumbling of our stomachs and we decided to pop into the Racecourse Tavern for lunch. With our bellies full and our mood lifted we head back across the city in our convoy of three snappy and overheating cars towards Collingwood to explore another lot of Housing Commissions.Collingwood is known for its eclectic mix of fancy bars and hipster markets but it also has a hidden and tough reality, like most of Melbourne's inner suburbs, we captured its battle between beautiful elegant old heritage houses and brown brick factories covered with colourful and amazing graffiti. Running out of time though, we quickly move on to North Melbourne and ACOPA (Australian Centre Of Performance Arts) who have been super supportive of our film. Every time you go there it's like coming home, you feel the art and creativity flow through the beautiful exposed brick walls. The centre is run by a lovely couple who are always happy to help the arts in any way they can. Our full day of location scouting ended in Northcote with an older house and another alleyway - so many locations to choose from and so many more to see, including the historic Pentridge Prison and some amazing luxurious apartments but we'll fill you in on that next time, until next week, that's a wrap! What an awesome first week of Pre-Production on Choir Girl so far!! We started our week with an amazing day of auditions with ACOPA Studio providing the space and our Casting Manager Bridget Bordello providing the amazing talent. Our main cast members Krista Vendy (Polly) and Peter Flaherty (Eugene) joined us for the readings, along with Co-Producer Lucinda Bruce, taking the readings to another level, we had a lot of fun and Director, Michael Wormald, and Producer, Ivan Malekin, along with the rest of the team can't wait to announce the rest of our cast. Our 3rd day of PrePro finds us in a production meeting with our Director, Production Designer, Art Director, Producers and our "in film photos” Film Photographer and then heading to Dockland Studios in the afternoon to check out a potential space for building our sets. We’re all excited about the project and can’t wait to share our progress and end product with everyone!! Production Meeting means a crowed NPG (Nexus Production Group) Office.